Families, tourist and Washington, DC residents have the opportunity of touring the Petersen House. 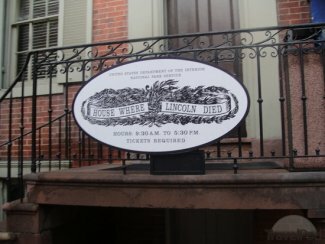 Acquired by Ford’s Theater Society in 2007, the Petersen House features permanent exhibits on two levels of the three-level and basement townhome. The exhibits in the Petersen House show the aftermath of Lincoln’s death and the evolution of Lincoln’s legacy. A few of the things visitors will see when visiting the House Where Lincoln Died is the actual pillow President Lincoln laid his head on. The tour includes three rooms in the house that are furnished in 1865 period pieces; none of the furniture is original to the house. Visitors use the same ticket that they used to tour Ford's Theatre. The House is open 9:30 am to 5:30 pm daily. Visitors will enter The Center for Education and Leadership from the back porch of the Peterson House. Located a mere 6 minutes from the Holiday Inn Washington, DC- Central White House Hotel, the Peterson House and Ford Theater are great and educational points of interest when visiting Washington, DC. Leave the car parked in our underground parking garage, and take public transportation or rent a bike and visit The Peterson House. Not only is the Holiday Inn Washington, DC- Central White House Hotel just moments from the Ford Theater, but also many other Lincoln inspired memorials and monuments. Our hotel is located in walking distance to the Lincoln Memorial and the White House. Holiday Inn Washington DC recently renovated hotel features a roof top pool, full-service restaurant, complimentary wi-fi and complimentary washer/dryer for all hotel guests. The hotel is walking distance to monuments, museums, and the business district. Major attractions are only minutes away. Remember, for the best rates at our hotel always book directly from our Official hotel website or via the Holiday Inn chain hotel web site. You are always guaranteed the lowest hotel rate available by using our site for reservations and will not find our hotel listed for a lower rate at any of the 3rd party reservation services like Travelocity, Expedia, or Hotels .com. By booking your hotel accommodations reservations directly at our site you will never be subject to extra or hidden fees that many 3rd party reservation companies charge. Additionally you will have more flexibility if there is a problem or you need to change your reservation.